The Yankees staked Sabathia to a 2–0 lead in the bottom of the first on an Alex Rodriguez sacrifice fly and an unusual RBI infield single from Hideki Matsui. Matsui hit a short popup to the left side of the infield, but there was a miscommunication between third baseman Chone Figgins and shortstop Erick Aybar and the ball fell in for a single, enabling Johnny Damon to score from second. Vladimir Guerrero set up the Angels' only run in the top of the fourth, hitting a high fly ball to deep left field that looked to be a home run but bounced in front of the fence for a double instead, possibly due to the windy conditions. Guerrero scored two batters later on Kendry Morales' single. The Yankees added a run in the fifth on Matsui's second run-scoring single of the night, and a pair of Angels' errors led to New York's fourth run in the sixth. After reaching base on a walk, Melky Cabrera advanced to second on John Lackey's errant pickoff attempt. Derek Jeter then singled up the middle, but Torii Hunter overran the ball, allowing Cabrera to score without a play at the plate. Once again, the Yankees struck first in the second inning. After Nick Swisher worked a two-out walk—his first in this postseason—Robinson Canó hit his first career postseason triple to deep right-center field to score Swisher. In the bottom of third, Derek Jeter hit a solo home run to right field to give the Yankees a 2–0 advantage. The Angels fought back in the fifth. After Maicer Izturis hit a leadoff ground rule double to right field, Erick Aybar's one-out single brought Izturis home to cut the lead in half. Later in the inning, New York starter A.J. Burnett's bases-loaded wild pitch caused the game to be tied at two. Both teams threatened multiple times in the ensuing innings, but neither scored and the game was sent to extra innings. In the top half of the eleventh, Gary Matthews, Jr. drew a walk off Yankees reliever Alfredo Aceves, advanced to second on a sacrifice bunt by Erick Aybar, and scored on an RBI single by Chone Figgins. At this point, the weather took a turn for the worse, which included rain and snow falling. But the Yankees battled back. In the bottom half of the frame, Alex Rodriguez tied the game with a leadoff home run off Angels closer Brian Fuentes. Then, in the thirteenth inning, Melky Cabrera managed to reach on an error committed by Izturis, consequently driving in the winning run. Izturis had the option of throwing to first for the second out, but instead attempted a tough throw to get the force at second for a potential double play, completely missing shortstop Aybar. Figgins, who was backing up the play, came up with the ball in an attempt to get the play at the plate but it slipped out of his hand. Jerry Hairston, Jr., who had reached on a single to start the inning, came around to score on that error. Alex Rodriguez's eleventh-inning home run was his second late-inning game-tying home run in this postseason. Both were off opposite team's closer (Minnesota Twins' Joe Nathan, in ALDS Game 2). Yankees ace CC Sabathia started Game 4 on three days' rest, which proved to be no problem, as he pitched eight strong innings, allowing only one earned run, five hits, and two walks, while striking out five. For the fourth straight game in the series the Yankees scored first. Alex Rodriguez hit a two-run home run, tying a postseason record set by Lou Gehrig and Ryan Howard for recording an RBI in eight consecutive games. Melky Cabrera added four RBIs. The sole Angels run came on a fifth-inning solo home run by Kendry Morales. The game included three controversial calls by the umpiring crew that third base umpire and crew chief Tim McClelland—who made two of the three calls in question—admitted were in error, drawing more attention to the argument for instant replay in baseball. Unlike the previous four games, this time the Angels scored first. With Chone Figgins on third base and Bobby Abreu on first, Torii Hunter singled to center field, scoring both Figgins and Abreu. Hunter then scored on an RBI double by Vladimir Guerrero, followed by a Kendry Morales RBI single that scored Guerrero from second. All this was done before the first out was recorded. From that point on, neither starter—John Lackey for the Angels and A.J. Burnett for the Yankees—allowed a run until the seventh inning. In the top half of that inning, Lackey worked into a bases-loaded jam with two outs when manager Mike Scioscia replaced him with Darren Oliver. Mark Teixeira connected with Oliver's first pitch for a double that scored all three inherited runners—Melky Cabrera, Jorge Posada, and Derek Jeter. After an intentional walk to Alex Rodriguez, Hideki Matsui singled, scoring Teixeira and tying the game. Oliver was replaced with Kevin Jepsen, who yielded a triple to Robinson Canó that scored Rodriguez and Matsui, giving the Yankees a two-run lead. In the bottom half of the seventh, Abreu hit an RBI groundout that scored Jeff Mathis from third. Hunter then drew a walk, followed by a Guerrero single that scored Erick Aybar, and a Morales single that scored Hunter, giving the Angels a one-run lead. The Yankees threatened Angels closer Brian Fuentes in the ninth inning. With two outs, Fuentes loaded the bases, but Nick Swisher popped out to end the game. Game 6 was originally scheduled to be played on Saturday, October 24, but was postponed because of rain. Angels' gaffes once again proved costly. In the top of the second, baserunner Vladimir Guerrero ran too far from first base on a fly ball out and was doubled off. The game remained scoreless until the top of the third inning when Bobby Abreu singled Jeff Mathis home to give the Angels the early lead. The Yankees left six men on base in the first and second innings before they finally broke through in the bottom of the fourth after Johnny Damon lined a two-run single to give the Yankees the lead for the remainder of the game. Alex Rodriguez walked with the bases loaded to force in another run. Saunders was then removed in favor of Darren Oliver, who pitched 2 2⁄3 shutout innings. Andy Pettitte pitched a strong game, allowing one run in 6 1⁄3 innings while striking out six. Mariano Rivera entered the game in the eighth inning for a six-out save. Guerrero singled in a run with two outs to close the gap to 3–2. In the bottom of the eighth, the Angels misfielded two sacrifice bunts by the Yankees, a fielding error by Howie Kendrick and a throwing error by pitcher Scott Kazmir, eventually leading to two runs. Rivera retired the side in the ninth to record the Yankees' 40th American League pennant. ↑ "Yankees 5, Angels 2: Yankees Win A.L.C.S., 4-2". New York Times. October 25, 2009. Archived from the original on October 27, 2009. Retrieved October 26, 2009. ↑ "WS games to start 40 minutes earlier". ESPN.com. May 18, 2009. Archived from the original on May 20, 2009. Retrieved May 18, 2009. ↑ "Boxscore:LA Angels vs. NY Yankees - October 16, 2009". MLB.com. Archived from the original on October 20, 2009. Retrieved October 16, 2009. ↑ "Boxscore:LA Angels vs. NY Yankees - October 17, 2009". MLB.com. Archived from the original on October 21, 2009. Retrieved October 18, 2009. ↑ "Boxscore:NY Yankees vs. LA Angels - October 19, 2009". MLB.com. Archived from the original on October 22, 2009. Retrieved October 19, 2009. ↑ "Boxscore:NY Yankees vs. LA Angels - October 20, 2009". MLB.com. Archived from the original on October 24, 2009. Retrieved October 20, 2009. ↑ "Boxscore:NY Yankees vs. LA Angels - October 22, 2009". MLB.com. Archived from the original on October 26, 2009. Retrieved October 22, 2009. 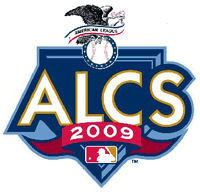 ↑ "Boxscore:LA Angels vs. NY Yankees - October 25, 2009". MLB.com. Archived from the original on October 27, 2009. Retrieved October 25, 2009. 1 2 3 4 5 6 Associated Press (October 16, 2009). "Sabathia cools off Angels as Yankees grab Game 1". ESPN.com. Archived from the original on October 23, 2009. Retrieved October 17, 2009. ↑ Castrovince, Anthony (October 21, 2009). "Umpires shaky on several Game 4 calls". Los Angeles Angels of Anaheim official website. Archived from the original on October 25, 2009. Retrieved October 23, 2009. ↑ Caple, Jim (October 20, 2009). "Umpire errors a real embarrassment". ESPN.com. Archived from the original on October 24, 2009. Retrieved October 22, 2009.